It is a common observation that the resistance of a conducting film on a flexible substrate increases when subjected to strain, albeit with a few exceptions (such as a variant of conducting polymer PEDOT: PSS, where the reverse is observed). This phenomenon of increasing resistance upon application of strain is particularly interesting when studied in the case of 2D materials, and especially on graphene. In this work recently published in Journal of Physics: Condensed Matter, Shaina et al. investigate charge transport in reduced graphene oxide on a flexible substrate under strain: find out more from the authors below. Straining pristine graphene leads to many interesting observations, such as band-gap opening under uniaxial strain, generation of colossal magnetic field under non-uniform strain, and alteration of charge transport. The applied strain provides a knob for tuning the properties of graphene, although observable changes are seen only at strain values as high as 20%. However, reduced graphene oxide (rGO) differs from pristine graphene, mostly due to the presence of functional groups that inhibit the charge transport by perturbing the sp2 bonded networks. This perturbation makes rGO a disordered system wherein, due to layered morphology, the electrical transport depends upon the order of stacking and upon the interface. The modes of conduction comprise of intra-grain and inter-grain transport via a charge-hopping mechanism. Studies reported in this direction have suggested strong localization — for example, variable range hopping (VRH) transport — at very low temperatures, and multiple modes of conduction at higher temperature. However, there have been very few studies on temperature-dependent charge transport of films that are subject to strain. Such studies are important in identifying the conduction mechanisms and conduction bottlenecks in the presence of strain. Firstly, the quasi-periodic deformations that are formed when the sample is subjected to strain cause local geometrical thinning of rGO films. The global resistance of the film typically increases by an order of magnitude at 10% strain, purely due to this local geometric effect. 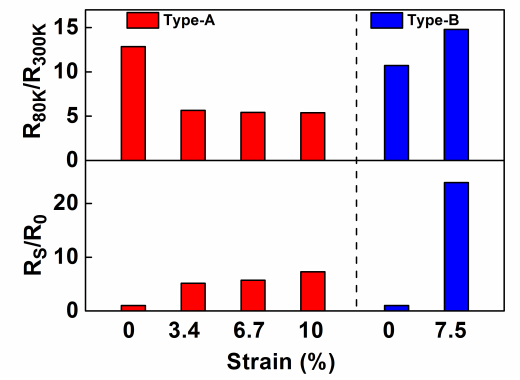 At these same locations, the release of substrate-induced strain mediates locally enhanced inter-flake interactions in the layered film. This second process results in relatively favourable temperature-dependent conduction, despite the increased room-temperature resistance value. Our study is of broad interest to the community of researchers working in the area of charge transport in layered 2-D materials, as well as those working in flexible electronics. The method discussed here provides a template to analyse the transport mechanisms in other 2-D layered systems when subjected to strain, which is of special significance in the area of flexible devices. Ms. P. R. Shaina and Mr. Biporjoy Sarkar are research scholars at Department of Physics, IIT Madras, India. Mr. Tushar Sakorikar is a research scholar at Department of Electrical Engineering, IIT Madras. Dr. M. K. Kavitha currently works as a postdoctoral fellow at Department of Physics, IIT Madras. Her research interests include synthesis of semiconductor/graphene hybrid materials and its optical applications. Dr. Pramitha Vayalamkuzhi is currently an INSPIRE Faculty at the Department of Electrical Engineering, IIT Madras. Her research interests include diffractive optics, graphene photonics and singular optics. Dr. Manu Jaiswal is an Assistant Professor at Department of Physics, IIT Madras. His research interests include physics of graphene and 2D systems.